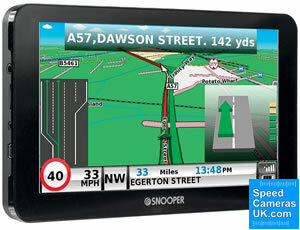 Snooper S8110 Truckmate is preloaded with truck data and attributes and is designed for use in large vehicles and HGV's and features here European street-level maps. Snooper Truckmate also includes AdBlue Petrol Stations points of interest database so you will always be able to find the nearest petrol station. There is also a car mode so you can use the satellite navigation system in your car. A FREE UK economy delivery option is available on all orders over £50. We also offer a choice of premium delivery, including guaranteed next working day and international. For more information please see delivery information. 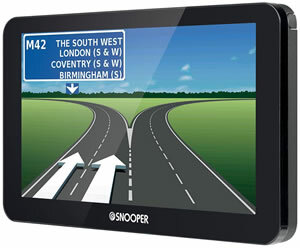 The Snooper S8110 Truckmate sat nav is designed especially for drivers of trucks, HGV's and other large vehicles. Featuring an impressive 7-inch LCD touchscreen display the Snooper S8110 Truckmate also boasts a built-in DVB-T2 Digital Freeview TV, which you can watch while you wait to be loaded or unloaded. The Snooper S8110 Truckmate also features TMC traffic information service and an enhanced 3 watt speaker built-in and also an FM Transmitter that will provide street-by-street directions to your vehicles speakers. Full European Mapping is provided for the UK, Republic of Ireland and Eastern and Western Europe. These preloaded maps are free to update for the lifetime of the Snooper S8110 Truckmate satnav. Before inputting a route the Snooper S8110 Truckmate allows you to input your truck dimensions (height, width, length), weight and the load type. 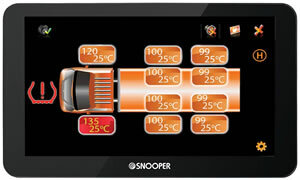 The Snooper S8110 Truckmate will then only route you along appropriate roads for your vehicle. This feature can help you to save a lot of driving time and fuel with the avoidance of low bridges, narrow roads and more. Post code searches for destinations is provided by Royal Mail and HERE mapping. Snooper S8110 Truckmate TMC traffic information service will alert you to traffic incidents in the road ahead. When notifying you of traffic incidents the the Snooper S8110 Truckmate will suggest alternative routes to drive to avoid delays on congested road(s). On screen information includes speed limits for most roads in Europe. You can choose car speed limits or trucks 3.5tonne or overspeed limits. Furthermore junction view and lane guidance at major junctions will be displayed on screen. Optionally, speed cameras can also be downloaded to the Snooper S8110 Truckmate at an annual, quarterly or monthly charge. The Snooper S8110 Truckmate uses the Snooper AURA speed camera database, this is the same database as used with Snooper's range of dedicated speed camera detectors such as the Snooper 4ZERO Elite BT. Click here to read more about the AURA speed trap database. Please check with the local/country laws before using speed camera database warnings outside of the United Kingdom. You can also connect a compatible smartphone with the Snooper S8110 to make and receive Bluetooth, handsfree calls. When entering and choosing your route you will have a choice of quickest route, shortest route, avoiding toll roads, avoiding motorways or the most economical, cost-effective route. You can also search and navigate by Junction number and create bespoke routes, select roads to drive on. Multiple-drop locations - if you are visiting or delivering to multiple places along the same journey. You can add up to 16 different addresses just by adding the post codes. Over 2 million points of interest along your route will include truck stops, truck restaurants, hotels, petrol stations, speed camera, golf courses, cash machines, shops plus many more. Local petrol stations will be available to search and drive to. There is also a corridor search that will suggest points of interest along your pre-programmed route. You can also increase the font size of on-screen Snooper S8110 Truckmate road names and numbers making it easier and safer to read whilst driving. 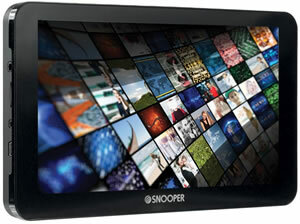 The Snooper S8110 also features an in-built route time which will tell you when to take a break. The Snooper satnav will also tell you how much time you have before taking your next break. If after a days trucking you wish to use the Snooper S8110 Truckmate sat nav in a car or other smaller vehicle where bridge heights, road widths, etc isn't an issue you can simply select the Snooper S8110 Truckmate 'car mode'. The Snooper S8110 Truckmate is also fully compatible with Tyre pressure monitoring which is available as an optional extra. The tyre pilot Tyre Pressure Monitoring system (TPMS) tells you, as you are driving, what the tyre pressure is and you will be able to see abnormal temperature increases in the tyres. The Tyre Pressure Monitoring System can help you achieve the optimum level of tyre pressure. The results of using the TPMS can save up to 10% in fuel charges due to correctly inflated tyres and keep track of tyre condition using the TMPS can extend tyre life by 35%. The Snooper software will only operate on the following Mac based operating systems: Mac iOS X - Yosemite, El Capitain and Sierra. 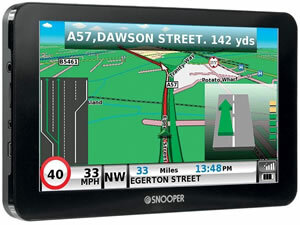 Looking for more information on the features of the Snooper S8110 Truckmate sat nav or how it installs in your vehicle, etc? View the S8110 manual by clicking the PDF logo below. The manual opens in PDF format. Like all Snooper speed camera detectors and sat navs, the Snooper S8110 gets its speed camera locations via the Snooper AURA speed camera database. Updated daily, the AURA database can be downloaded to the device via a PC or Mac connected to the Internet with USB connection. It's important you regularly update, as the S8110 GPS database is only as good as the last download. Install the Snooper S8110 Truckmate on your trucks windscreen using the provided Windscreen Mount or on your dashboard with the included Dashmount Disc. You should ideally locate the satnav in a position where you have a clear view of the screen without distracting you from concentrating on the road ahead as well as road traffic congestion and weather conditions.